Distribution of Instrumental Music FTE across Ankeny Schools in 2016-2017. Updated from 2014 presentation at Drake University on vertical teaching. Primary instruments of secondary instrumental music teachers. Updated from 2014 presentation at Drake University on vertical teaching. 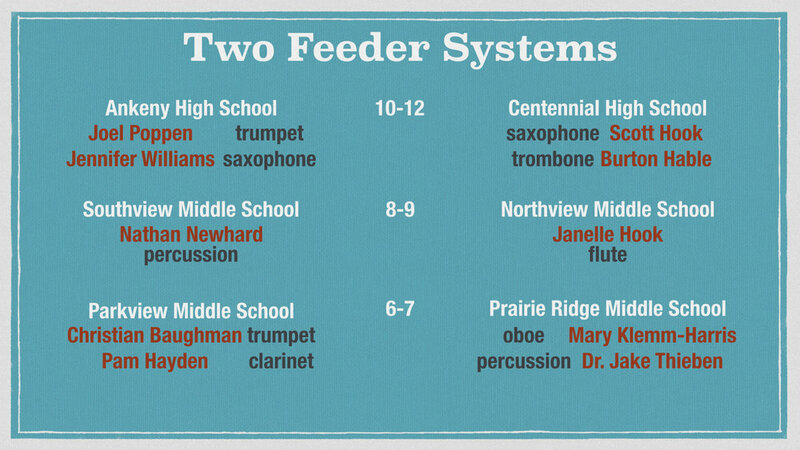 Lucky for us, we will be adding a new band director at Northview AND a new band director at Southview next year, expanding the vertical teams to six! Schedules were developed so that no instrumental rehearsals occurred simultaneously, allowing the team of teachers to "push-in" lessons during rehearsals. Students are also pulled for lessons from Choir, Study Hall, or free periods. Secondary instrumental (maroon) and vocal (black) rehearsals in North system. Updated from 2014 presentation at Drake University on vertical teaching. Class times for secondary schools. Updated from 2014 presentation at Drake University on vertical teaching. Secondary instrumental (maroon) and vocal (black) rehearsals in North system. Updated from 2014 presentation at Drake University on vertical teaching. Class times for secondary schools. Updated from 2014 presentation at Drake University on vertical teaching. 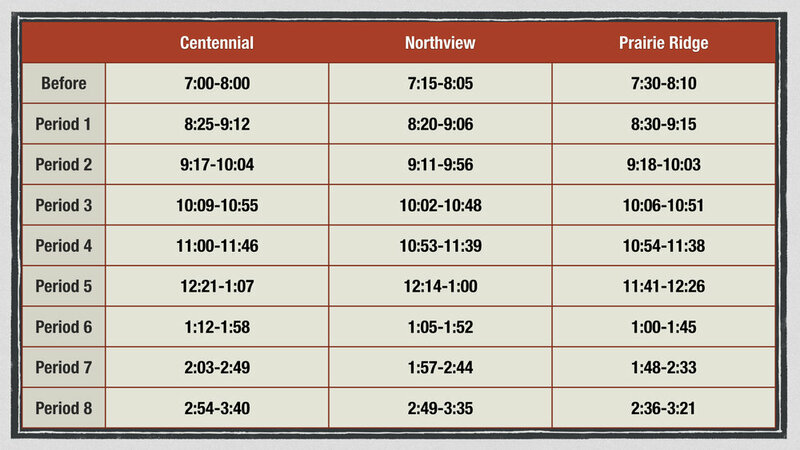 The district functions on an 8-period, A/B schedule. Ensembles listed with a letter next to their name rehearse only during those days. For example, there is an 8th Grade A Day Band AND an 8th Grade B Day Band. 6-9th Grade Students who are not in Choir have a Study Hall. These typically occur where Choir is listed. 10th Grade Students may have a Study Hall depending on their schedule and can occur any period. 11-12th Grade Students in good academic standing have Free Periods instead of Study Hall. These can occur any period. On Wednesdays, students start one hour later with shortened class periods to allow for professional development in the morning. On those days, we typically travel first through third period, and then remain at our home buildings for the remainder of the day. Sometimes, this means rotating lessons from our home building on to this day from another day. Other times, it means a chance to catch up on administrative work or to meet with other teachers in our home buildings. During the first three years of implementation (2013-16), we were able to see every 6-12th grade student on a 6-day rotation (A1, B1, A2, B2, A3, B3). Due to the sheer number of students (good problem!) in the 2016-17 school year, we had to expand to an 8-day cycle (A4, and B4). At the high school, this means there are 8 distinct lesson days. At the two middle schools, A4 and B4 days are used as make-ups when lesson days fall on Wednesdays, field trips, assessments, assemblies, sick days, snow days, etc. We are able to guarantee each student 10 lessons per semester. We are hoping with our added staff next year, that we will be able to go back to a six day cycle. The football stadium is located there. Most of the 10-12th grade students can drive themselves to before school or evening rehearsals, while most 9th grade students cannot. Traffic conditions between the buildings are not conducive to having students attempt to travel between buildings before the beginning of first period. Jazz Bands occur at the respective buildings, except 9th graders are included in the three high school jazz bands. Transportation is provided for the 9th grade students from the 10-12 building back to the 8-9 building in time for their school day to begin. What makes our model truly vertical is our team of 5 directors teaching lessons and rehearsals 6-12. Our team’s primary instruments include saxophone, trombone, flute, oboe, and percussion. This allows us to teach the vast majority of our lessons 6-12 to students on our primary instruments. Students are receiving direct instruction from an expert! In theory, we have four teachers that can teach lessons in any given period, with one on the podium. In practice, we are very close to this ideal. The problem comes in the sheer number of students we have to instruct and making sure they are receiving a lesson, as well as the “pro” teacher not being able to access kids in their own rehearsal for lessons. The pros far outweigh the cons. Kids very rarely miss lessons because we come to them in their rehearsals! We are hoping to give each other podium time across ensembles next year to enable the "pro" to teach their primary instrument in every ensemble. As we look to add a new person to our team, our 6-7 building is also adding a 7th grade team, meaning we will have an additional 7th Grade B Day band during 3rd period. The choirs at all three buildings will also be expanding. 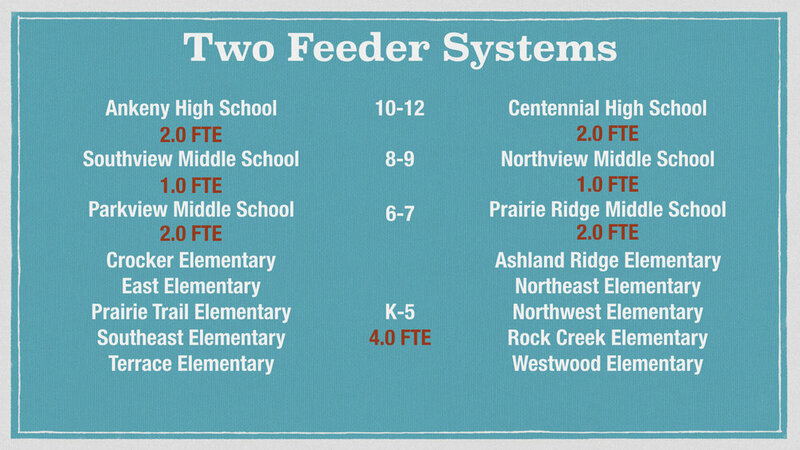 Hopefully as we narrow in on our new staff and master schedules, I can update this post to reflect those changes.